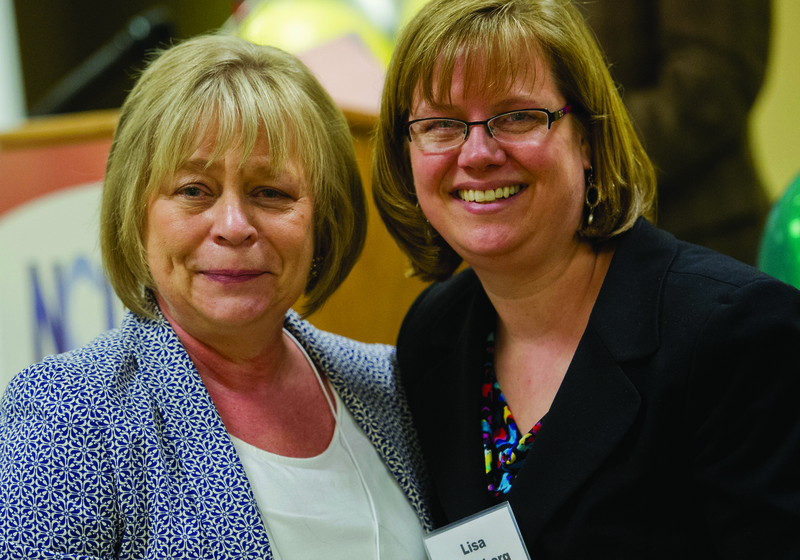 Lois Johnson, the 2013 LifeSmarts Coach of the Year with LifeSmarts Program Director Lisa Hertzberg. Lois Johnson has six kids, seven grandkids, and 100’s of LifeSmarts kids. She has been coaching for 16 years, continually expanding her LifeSmarts family. Johnson has now entered her last year coaching the program. Retirement lies ahead, but first she aims to lead Willow River High School to a seventh consecutive Minnesota state championship and a trip to Orlando for the 2014 national championship. Throughout her years participating in LifeSmarts, Johnson has had her fair share of laughs, tears, and heart palpitations. “I get really nervous during competitions,” says Johnson. “I just put my head down on the table; I can’t even look.” A few years ago, Dougie, a special education student from Willow River, a K-12 school with fewer than 500 students, enrolled in Johnson’s LifeSmarts class. LifeSmarts is a program designed to prepare all students, not just straight-A students, for the basics skills they need to navigate life’s pitfalls and obstacles. “The information is so practical,” Johnson explains. “You can take algebra or geometry and learn some stuff, but I tell my students I’m going to teach you things you’ll actually be using. It’s survival.” The lessons learned through the LifeSmarts curriculum will be valuable throughout life; avoiding identity theft, learning how to deal with insurance policies, and renting your first apartment. But the relationships formed in LifeSmarts can also last a lifetime. “I’m proud to be a part of the first-ever LifeSmarts wedding,” says Johnson. “One of my former LifeSmarts kids is marrying a boy from Alabama, someone she met at the LifeSmarts national competition. I was invited to the wedding, and they told me they were going to have LifeSmarts questions on every table.” At this LifeSmarts event Johnson will have no need to assume her all-to-familiar competition position. Head held high, she will proudly welcome this new addition to her LifeSmarts family.